Su aspecto es de lo más peculiar. De un tronco más o menos corto y grueso salen numerosas hojas carnosas. La planta es de un color verde brillante, pero según el sol que reciba se puede volver verde-amarillenta y los bordes de las hojas rojizos. Cuando florece, en invierno, da grupitos de florecillas blancas de cinco pétalos generalmente. 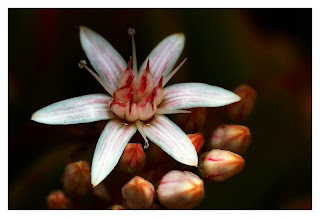 Crassula argentea originally comes from South Africa, where it grows into a small tree of about 10 feet. Blooming Time: Winter- I have grown Jade plants for many years without ever seeing one in bloom. This year patience has rewarded me with hundreds of star-shaped white flowers at the tip of the branches. Culture: Crassula argentea needs full sun to partial shade all year. If it does not get enough light the stems will be thin and break easily. Water Jade plants carefully, the most common cause of death in jades comes from overwatering. Water jade plants only when completely dry. I always delay watering mine until the leaves get a little wrinkled. Fertilize in the growing season once a month with a balanced fertilizer diluted to ½ the recommended strength. A good compost for jade plants consists of 1 part peat moss to 1 part loam to 1 part sand with small gravel added to increase drainage. It is not necessary to prune Jade plant unless it is getting too large. Propagation: Crassula argentea are propagated by leaf and stem cuttings. A leaf of a Jade plant will readily root in moist sand. Stem cuttings root just as easily.